Back in my bachelor days, it'd be pretty common to completely wing dinner as I cooked it based on whatever ingredients I could scrounge up. Usually, somehow, I'd end up chopping up an onion, some pepper, maybe another veggie, and putting it in some kind of sauce with some kind of spices and putting it over something. Most times, it worked. Other times, well, it worked with a little more hot sauce. Obviously I didn't starve, so it all went alright enough. Get married...have to eat "real food"... I got out of the habit of doing that. We had to follow "actual recipes" said the wife. What? Well, okay, yes dear. Still haven't starved. 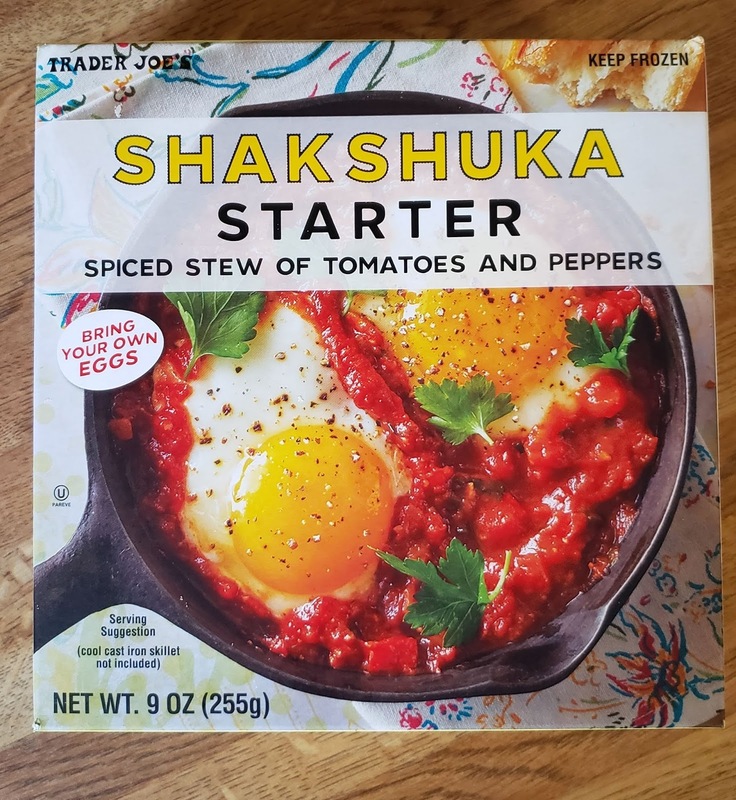 But one day, beaming widely and happily, Sandy brings home a couple packages of the new Trader Joe's Shakshuka Starter, exclaiming "I can't wait to have this for breakfast!" Kinda odd...normally she hates tomatoes and most tomato-heavy products...Well, okay, yes dear. It's pretty good. This particular shakshuka is pretty thick and chunky with tomato bits and onions and peppers - it's definitely towards the thicker definition of stew. It's simply and naturally flavored with the usual suspects - onion, garlic, cilantro, a little pepper, a little cumin, etc - which are spicy not in a hot hot heat way but more in an herbal manner. It's all pretty well balanced and non-offensive...I'd even say pretty downright pleasant with no need for anything added. Except the eggs, of course. Gotta add your own eggs and kinda cook it in a little "pocket" in the stew. This is the key step, though, especially if you're like Sandy and me and don't really enjoy poached/sunnyside up style eggs. That runnyness? No thanks. Sandy was wise enough to keep the yolk out of her eggs, leaving only egg white for her. As a result, her eggs were just about perfect and meshed nicely with everything else. My eggs, though? I kept it in and...ugh. Yolk got all gross and rubbery. That of course is not a knock against the actual TJ's product, but I did enjoy the meal less than I could have, so take not: Runny yolk or no yolk at all. Anyways, the shakshuka is good and fun. Fun to make, fun to eat, fun to say...I kinda felt like Buddy the Elf saying "Fransisco." And it's cheap - only maybe like $2 for the package. Good value too then. Double fours. Also it can be used for pizzas or any recipe that calls for tomato sauce. Why limited to shakshuka? BE CREATIVE! Hey, sounds like you were eating pretty good as a bachelor too! I just lived on noodles. Being able to throw anything together is quite admirable, I still have friends who wouldn't even recognize ingredients.